The Oxford Research Centre for the Humanities (TORCH) is currently running a series of events on Humanities and Science. 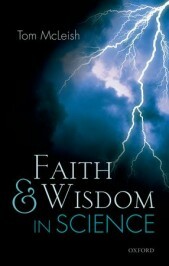 On 11 February 2015, an Oxford-based panel of three disciplinary experts — Sally Shuttleworth (English Literature), John Christie (History), and Ard Louis (Physics) – shone their critical torchlights on Durham physicist Tom McLeish’s new book Faith and Wisdom in Science as part of their regular ‘Book at Lunchtime’ seminars. How can we understand the relation between science and narrative? Should we even try to? Where can we find and deploy a constructive cultural narrative for science that might unlock some of the current misrepresentations and political tangles around science and technology in the public forum? In exploring the intersection of faith and science in our society, positive responses and critical questions at the recent TORCH Faith and Wisdom in Science event turned on the central theme of narrative. Ard Louis referred to the book’s ‘lament’ that science is not a cultural possession in the same way that art or music is, and urged the advantage of telling the messy story of real science practice. John Christie sketched the obscured historical details within the stories of Galileo and Newton, and of the Biblical basis beneath Frances’ Bacon’s vision for modern science, which serve to deconstruct the worn old myths about confrontation of science and religion. Sally Shuttleworth welcomed the telling of the stories of science as questioning and creative, yet suffering the fate of ‘almost always being wrong’. What resources can Judeo-Christian theology supply in constructing a social narrative for science – one that might describe both what science is for, and how it might be more widely enjoyed? The project we now call ‘science’ is in continuity with older human activities by other names: ‘natural philosophy’ in the early modern period and in ancient times just ‘Wisdom’. The theology of science that emerges is ‘participatory reconciliation’, a hopeful engagement with the world that both lights it up and heals our relationship with it. Eliot’s sources are T.H. Huxley, J.S. Mill, Auguste Comte, and of course her partner G.H Lewes – by no means a theological group. (Compte had even constructed a secular religion.) Perhaps this is an example of an entirely secular route to science’s story? Yet her insight into science as a special sort of deep ‘seeing’ also emerges from the ancient wisdom of, for example, the Book of Job. In his recent Seeing the World and Knowing God, Oxford theologian Paul Fiddes also calls on the material of Proverbs, Job, and Ecclesiastes to challenge the post-modern dissolution of subject and object. Participatory reconciliation emerges for both theologian and scientist motivated to draw on ancient wisdom for modern need. Was Eliot, and will all secular thinkers in the Western tradition be, in some way irrevocably connected to these ancient wellsprings of our thinking? An aspect of the ‘baggage’ most desirable to drop, according to Shuttleworth, is the notion that scientists are a sort of priesthood. Surely this speaks to the worst suspicions of a mangled modern discourse of authority and power? Louis even suggested that the science/religion debate is really only a proxy for this larger and deeper one. Perhaps the Old Testament first-temple notion of ‘servant priesthood’ is now too overlain with the strata of power-play to serve as a helpful metaphor for how we go about enacting the story of science. But science needs to rediscover its story, and it is only by acknowledging that its narrative underpinnings must come from the humanities, that it is going to find it. Headline image credit: Lighting. CC0 via Pixabay. Tom McLeish is Professor of Physics and was Pro-Vice-Chancellor for Research at Durham University from 2008-2014. He is a Fellow of the Institute of Physics, the Royal Society of Chemistry, the American Physical Society, and the Royal Society. He is involved in science-communication with the public via regular radio, TV and schools lectures, discussing issues from the Physics of Slime to the interaction of Faith and Science. He is the author of Faith and Wisdom in Science.